ELLs learn about tamales, holiday food traditions and Three Kings Day at my latest holiday-related New York Times Learning Network post. It includes a student interactive and teaching ideas. Christmas, Hanukkah, and Kwanzaa are all coming-up, and I thought it would be timely to create a “The Best…” list focusing on those holidays. Obviously, there are a lot more materials about Christmas out there accessible to English Language Learners than there are for the other two events, but I have found some for all of them. You can also find these links, and many more, under Holidays on my website. Here Are My Favorite Fun Christmas Resources (and “Feel Good” Christmas Stories For Christmas Day). Few, if any, of this links are really tailored towards “higher-order” or “critical” thinking. They all pretty much provide “just the facts” about the holidays. As usual, I couldn’t really find good online resources that help broaden the topic to look at issues like over-consumption or commercialism in an accessible way. It’s certainly feasible to do so, though, in classroom lessons building off the information learned from the sites on this list. For example, I’ve had students define what the word “gift” means, and then reflect on what have been the most meaningful gifts that they have given or received. Students then conclude (truthfully, I hope) that they can’t use the cost of objects to measure their value. I think it’s also worth reading this article called Christmas Curriculum: Unintended Consequences. ESL Civics For ESL Students has an accessible Christmas Lesson with nice images and simple text. The New York Times has a slideshow on how Christmas is celebrated around the world. Christmas Around the World is a slideshow from CBS. Here’s a “drag-and-drop” Christmas vocabulary activity from Visual ESL. The Beacon Learning Center has a nice story about a Christmas Bear. Here’s a news story from CBBC Newsround about childhood obesity and Christmas. It has audio support for the text. MES Games has an online Christmas vocabulary learning activity and game. What’s Christmas without music? The British Council has a Christmas Song. Students can send a this Gingerbread Cookie Card. Another is the Merry Message from Better Homes and Gardens. Have Santa Claus deliver an audio message either by recording your own voice or by using the text-to-speech feature. Students can then post the link to their message on a blog or website. Scholastic has some nice online Christmas resources. I’m adding three holiday lessons from ESL Holiday Lessons to this list. They include both online and hand-out materials and activities. Renee Maufroid, an English teacher in France, develops a lot of excellent ESL/EFL online activities. His latest is a nice game on The Twelve Days of Christmas. Here are two listening activities related to Christmas from ELLO. A History of Christmas Trees that is accessible to Intermediate English Language Learners. Social Studies For Kids has a very accessible and short description of the truce. There are some excellent “music videos” on YouTube showing images with the soundtrack from two good songs about the Truce. Since so many districts block YouTube, you can download them into your laptop and use a converter so it’s viewable at school. One video features the song “Bellau Wood” and is sung by Garth Brooks. Here are the lyrics. The language is fairly accessible to English Language Learners. This video has good images and uses a different song called “Christmas In The Trenches.” It’s sung by John McCutcheon, and you can find the lyrics here. The language is a little difficult and “old-fashioned” since it’s taken from a letter written by a soldier who participated in the Truce. The Center For The New American Dream has a good booklet in PDF form called “Simplify The Holidays.” Its language is not accessible to anyone other than advanced English Language Learners, but teachers can modify it for classroom use. It provides a lot of good information to help students think critically about the massive consumption focus of culture during this time of the year. You have to register in order to gain access to the PDF, but it just takes a few seconds. Changing The Present is an effort to encourage giving of charitable gifts over the holidays. That in itself doesn’t make it stand-out in any major way — there are quite a few other groups with websites that do the same thing. Changing the Present stands out, however, by two slickly-produced spoofs on typical television commercials that push consumption this time of year. These accessible videos can be excellent points to initiate discussion on the meaning of the holidays with students. Santa Claus Boy Escape is the latest addition to this list. It’s an online video game useful for English language-learning, as I’ve described in my article Pointing & Clicking For ESL: Using Video Games To Promote English Language Development. I know it sounds strange, but if your school’s content filter will let it through, it’s a useful and fun game. A similar game is called Christmas Gift Escape. Here’s the Walkthrough. Gatuno in Christmas offers the challenge of helping Gatuno find a gift for a child. Here’s the walkthrough. The Christmas Fix is another online video game. Here’s the Walkthrough. A San Francisco Chronicle slideshow about a Holiday Lights Parade…on water. The Sydney Morning Herald has a slideshow called Lighting-Up For Christmas. It has great images of how people are decorating the outside of their homes during the holiday season. That’s A Wrap is a Washington Post slideshow on a Christmas-wrapping contest. Crazy Christmas Traditions is a slideshow from TIME Magazine. A Christmas Story slideshow comes from the Las Vegas Sun. January 6th is Three Kings Day. This holiday is celebrated in many Latino households — often more enthusiastically than Christmas Day. CBS News has an article with a couple of nice photos, too. Here are some photos of a Three Kings Celebration in Spain. The New York TImes has a slideshow of a Three Kings Day parade In Harlem. The End Of The Christmas Season is a slideshow from The Boston Globe. Marvelous & Massive Megawatt Displays is a collection of amazing Christmas decorations. The Washington Post has a slideshow on the Lighting of the National Christmas Tree. Renee Maufroid has created several new Christmas exercises for ELL’s. Chat with a Santa Bot. Gift of Christmas Escape is an online video game. Here’s the walkthrough. Have A Very Ridiculous Christmas is a slideshow from TIME Magazine. Interesting Things For ESL Students has a special Things For December page filled with Christmas exercises. Santa Gone Wild is a fun slideshow from TIME Magazine. Santa’s Little Helper is a short story. The Busy Elf is a song. “Insane Amounts Of Christmas Lights” is a slideshow from TIME Magazine. 8 Spectacular Christmas Light Shows on YouTube is a fun video collection. Christmas 2009 is a series of pictures from The Big Picture. Macy’s Brings Theater and Tech to Holiday Windows is a video from The Wall Street Journal. Here Comes Santa Claus! is a collection of the best Los Angeles Times photos about the big guy. Christmas Comes To The White House is a TIME Magazine slideshow. Baltimore Street’s Christmas Lights is a Wall Street Journal video. Here are some Christmas vocabulary exercises from Learning Chocolate. Beginning to look a lot like Christmas is a series of photos from The Boston Globe’s Big Picture. Teaching the Holiday Season are lesson plans from The New York Times Learning Network. Christmas Activities for Young English Learners is a collection from the British Council (thanks to CASLS for the tip). Here’s a video from The Wall Street Journal showing popular television commercials using a holiday theme. In pictures: 20 Guinness world records with a Christmas theme comes from The Telegraph. You Better Watch Out, You Better Not Cry is an NPR slideshow. 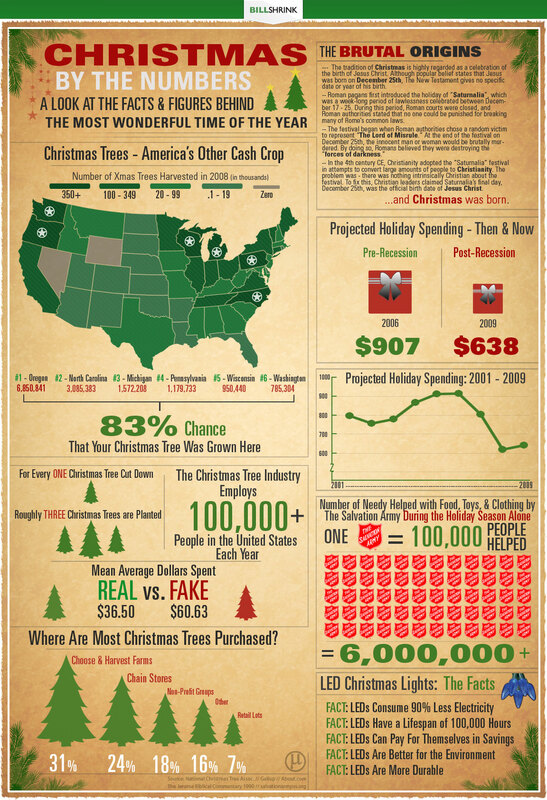 Holidays By The Numbers is an interesting infographic. Christmas in the Middle East is a slideshow from The Guardian. The world’s weirdest Christmas tradition is a slideshow from The Telegraph, though I wish they wouldn’t label them with such a derogatory description. Bethlehem Celebrates Christmas is a video from The Wall Street Journal. Holiday Windows is a video from The New York Times. Holiday Misgivings is another intriguing infographic. Escape from Santa’s Room is a fun online video game that can be used as a language-learning activity (you can read how I use these kinds of games in this article). Here is its Walkthrough. Christmas Across the Globe comes from The Big Picture. Christmas approaches is a photo gallery from The Boston Globe. Christmas – Links to Free Online ESL Worksheets, Lessons and More is from ESOL Courses. Merry Christmas From Lee Friedlander is a photo gallery from TIME. Ho Ho Hmm. Gun Club Offers Photos With Santa is from NPR. It’s Beginning to Look a Lot Like Christmas is a photo gallery from The Atlantic. Holiday Decorations Shine at The White House is a TIME slideshow. Infographic: The Visual History of Christmas Trees (I’m also adding this one to The Best Sites To Learn About Trees). Christmas trees around the world – in pictures is a slideshow from The Guardian. The 9 Most Christmassy Towns in America is from TIME. Worst Christmas gift ideas – in pictures is from The Guardian. Horror For The Holidays: Meet The Anti-Santa is from NPR. Christmas Around The World is a slideshow from ABC in Australia (thanks to Ira Socol for the tip). Photos: Santa Claus, the Holly, Jolly Stuntman is from TIME. Top 10 Things You Didn’t Know About Christmas is from TIME. A look at the legend behind Santa Claus is a slideshow from The L.A. Times. Santa Timeline: Before he was cheery and chubby is also from The Times. Best Christmas Movies is from The Huffington Post and includes video clips. ‘What’s Christmas without chopsticks?’ How other faiths celebrate December 25th is a CNN slideshow. Epiphany and Orthodox Christmas around the world is a slideshow from The Telegraph. In pictures: Christmas in the Orthodox world is from The BBC. Apples 4 The Teacher has a simple explanation of the holiday. Scholastic has some nice online Hanukkah resources. Here’s another simple explanation of the Hanukkah holiday. BBC Schools has a good site about Hanukkah, but it’s probably only accessible to advanced English Language Learners. EL Civics has a Hanukkah Lesson for English Language Learners. The Orange County Register has a slideshow showing a synagogue’s celebration of Hanukkah. A Menorah Lighting slideshow comes from the Las Vegas Sun. What is the deal with Hanukkah, anyway? is an infographic that describes the holiday fairly well. ESL Holiday Lessons has a nice one on Hanukkah. Hanukkah celebrations around the world – in pictures is from The Guardian. Hanukkah Lights 2018 is from NPR. EL Civics for ESL Students has a nice lesson on Kwanzaa. The History Channel also has resources on Kwanzaa. Scholastic also has online Kwanzaa resources. I’m adding a site called American Folklore to this list. It has many great short stories that would be accessible to English Language Learners, including one section on Holiday Stories and Winter Tales. Kwanzaa celebrations across the country is a Washington Post slideshow. Advent Calendar For English Students and Kids is from ESOL Courses. Type what you’d like Santa to say to a particular person, and Chatty Santa will say it. Then send it to the designated person or post its link on a student or teacher blog or website. The most wonderful time of the year has a dark underbelly: germs, bugs and general ickiness that can travel more quickly than Santa’s sleigh. We’re not trying to give you the willies, just suggesting a few easy ways to prevent problems and make your holidays even happier. Zoo animals receive Christmas gifts is a slideshow from CBS News. Stunning Christmas lights is another CBS slideshow. The British Council has a nice collection of Christmas activities. Holiday Foods to Avoid (And What To Eat Instead) is a slideshow from TIME. Christmas Around The World is a well-done classroom project. Christmas Around The World is a photo gallery from The Atlantic. The Life Of Christmas Trees, Before The Merriment is a slideshow from NPR. Here’s another video game: Christmas Eve Escape Game, and here’s its walkthrough. by Pixaal Eva Buyuksimkesyan has published the 36th ELT Blog Carnival (formerly known as the ESL/EFL/ELL Blog Carnival) and it’s a great one on holiday lessons. Google’s Santa Tracker has a interactive world map highlighting holiday traditions around the world (thanks to Google Maps Mania for the tip). 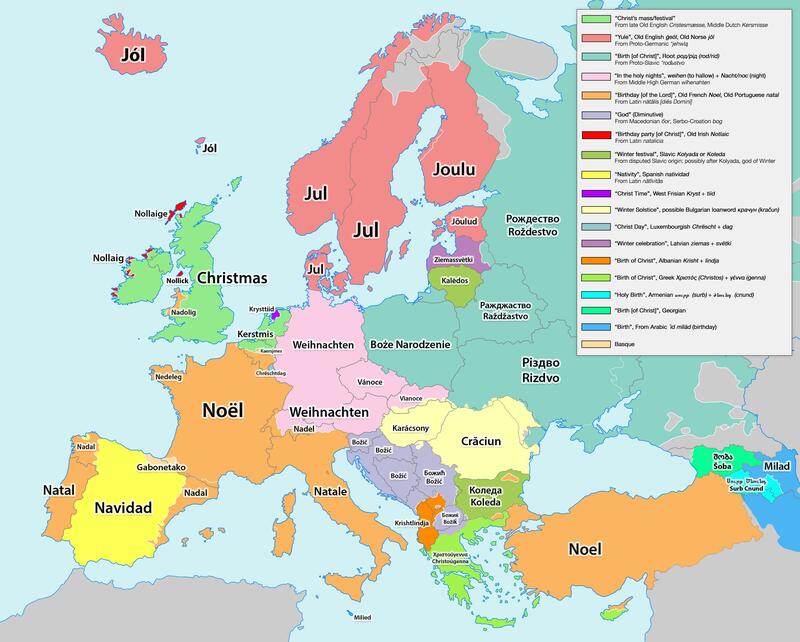 Here are two interesting word maps (also found via Google Maps Mania): one showing the word people use for Santa Claus, and the other the word used to describe Christmas. Here are many good ideas for ELL Christmas lessons from the British Council. Here are many Christmas-themed interactives from ESOL Courses. Christmas/Winter Holidays Around the World unit is from Share My Lesson. Christmas becoming less religious in U.S. is a lesson for ELLs from Breaking News English. 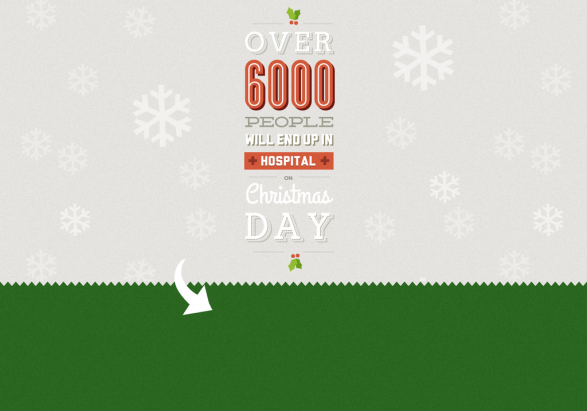 Here are 12 Christmas Infographics. It’s A Message lets you send a personal holiday message, along with images of snow falling on the address of your choices. Here’s the EFL Classroom 2.0 Christmas page. ‘How to celebrate Christmas with Technology: 7 ideas& a lesson plan.’ is by Christina Martidou. An expat Washington Christmas: Antelope and ptarmigan can be tough to find is from The Washington Post. TIME has published an interactive showing the most popular Christmas songs. Chatty Santa is one of my students’ favorite ways to use English and send holiday e-greetings. Christians Celebrate Across the Globe is a TIME slideshow. Here’s a lesson on the Merry Christmas Mr. Bean video. It’s from EFL Smart. Celebrating Christmas and the Holidays, Then and Now is from Pew Research. Santa, Santa, high in the sky is a song from The British Council. Classroom resources for Christmas is from Oxford University Press. Here’s an interactive Advent Calender explaining different Christmas symbols. Two Christmas Activities is from The British Council. Hanukkah History: Those Chocolate Coins Were Once Real Tips is from NPR. The 12 Days Of Quirky Christmas Foods Around The Globe is from NPR. America’s Christmas Gift Lists, as Seen by Google is from The New York Times. Teaching English has lots of great holiday lesson ideas for English Language Learners. Pandora’s Top Christmas Songs: From Mariah Carey to Eartha Kitt is from The New York Times. 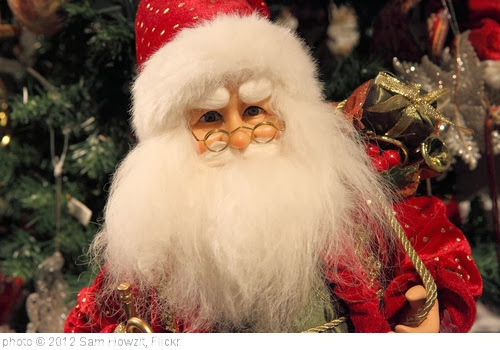 Santa Traditions Around the World is from Scientific American. The 15 artworks that define Christmas – in pictures is from The Guardian. Christmas from around the world – in pictures is from The Guardian. Smithsonian has a collection of holiday music from around the world. Santas Around the World is a great interactive from Esri. Thanks to Google Maps Mania for the tip. 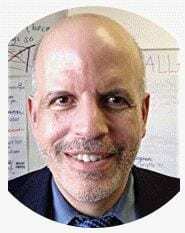 50 Holiday Related Activities For The ELT Classroom is from David Deubelbeiss. Krampus: The Dark Companion of Saint Nick is a photo gallery from The Atlantic. Krampus: the demonic Santa Claus you haven’t heard about is from Vox. Hanukkah Holiday Foods Tell A Story About Early Latinos is from NBC News. 7 surprising things everyone should know about Hanukkah is from Vox. The narration in this video is too fast for most English Language Learners, but would certainly be accessible to language proficient students. ELT-Cation offers some excellent lesson ideas for English Language Learners. How to teach … the last Christmas lessons of term is from The Guardian. Mog’s Christmas Calamity is a lesson from Film-English. The humor exhibited in this Darth Santa spoof would be a big hit for teenage boys who are English Language Learners, and I suspect others would enjoy it, too (note that there are a few seconds showing him drinking). Students can watch it and describe verbally and writing what they saw. Beyond Panettone: 5 Global Christmas Breads To Nibble On is from NPR. All The Ways Christmas Tries To Kill You is from Five Thirty Eight. Nativity Cat is from The Atlantic. What American Muslims Do On Christmas: New Traditions Emerge is from NPR. Twinkling Lights Spread Holiday Cheer Around the World is a photo gallery from NBC News. My Mexican-American Christmas: Posadas, Piñatas and Pastorelas is also from NBC News. Christmas in America: Over the Top, Close to the Heart is an unusual photo gallery from The New York Times. A Christmas Economy Thrives All Year in the Mountains of Mexico is also from The NY Times. How Kentucky Fried Chicken became Japan’s favorite Christmas tradition is from Vox. NASA can see your Christmas lights from space is also from Vox. The Many Faces Of Santa is from The Week. Boxing Day, explained is from Vox. On Three Kings Day, New Yorkers Celebrate with Beloved Parade is from NBC News. Becoming Santa is a photo gallery from The Boston Globe. Discovering the magic of Three Kings Day, from Puerto Rico to the US is from Quartz. Here’s a little something for you – a holiday season activity is a lesson from ELT Stories. Of course, I’d also brace myself for adolescent reaction to anything related to kissing. Let it Glow! Christmas Lights Shine Across the World is from NBC News. Parrandas, Posadas, ‘Burning the Devil’: Fun Latino Holiday Traditions is from NBC News. Seeing Santa in Black and White is from The New York Times. After dismal year, many Muslims look to Christmas for joy is from McClatchy News. Santa rides a camel? How the rest of world celebrates the holidays is from The Washington Post. Christmas: What do I need to know? is an interactive from The BBC. Christmas: Embattled From the Beginning is from The Wall Street Journal. Christmas around the world is a CNN photo gallery. Santa Claus Is Coming to Town is a photo gallery from The Atlantic. Essay: This Christmas, We’ll Leave Santa Mochi and Dumplings is from NBC News. 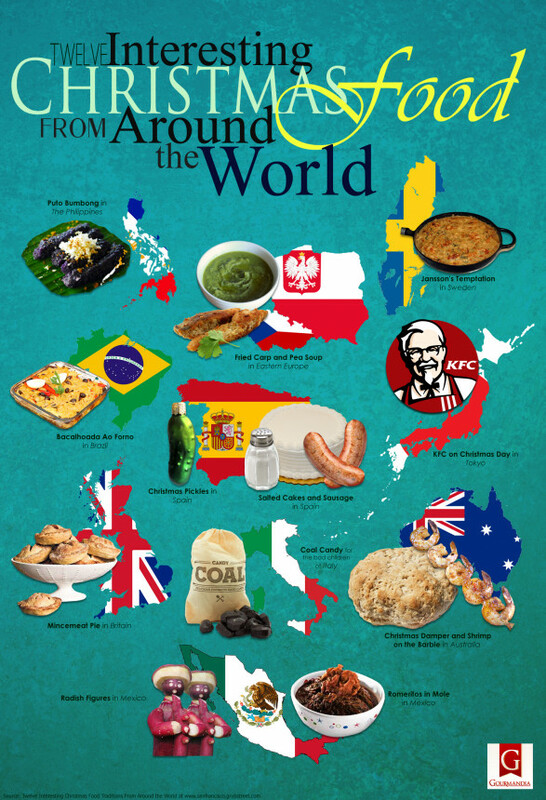 Christmas meals around the world is from The Week. A New Christmas Tradition: Take a Walk? is from The NY Times. Kwanzaa Was Started 50 Years Ago. Here’s Why is from TIME. The Surprising Story of Christmas in the United States is from TIME. 20 of the Most Joyful Christmas Photos of All Time is from TIME. A Christmas lesson plan is for ELL students and is from All at C.
This Is What Christmas Dinner Looks Like In 19 Different Countries is from BuzzFeed. Pictures of Christmas Past is from The Atlantic. I’m Dreaming Of A (Black And Brown And Native And) White Christmas is from NPR. Happy Holidays: Seasonal Suggestions for What to Read, Watch, Write About, Create and Debate is from The New York Times Learning Network. This is what Christmas dinner looks like in 20 countries around the world is from The Telegraph. Live from the North Pole: what’s new at Santa’s Village is from Google. 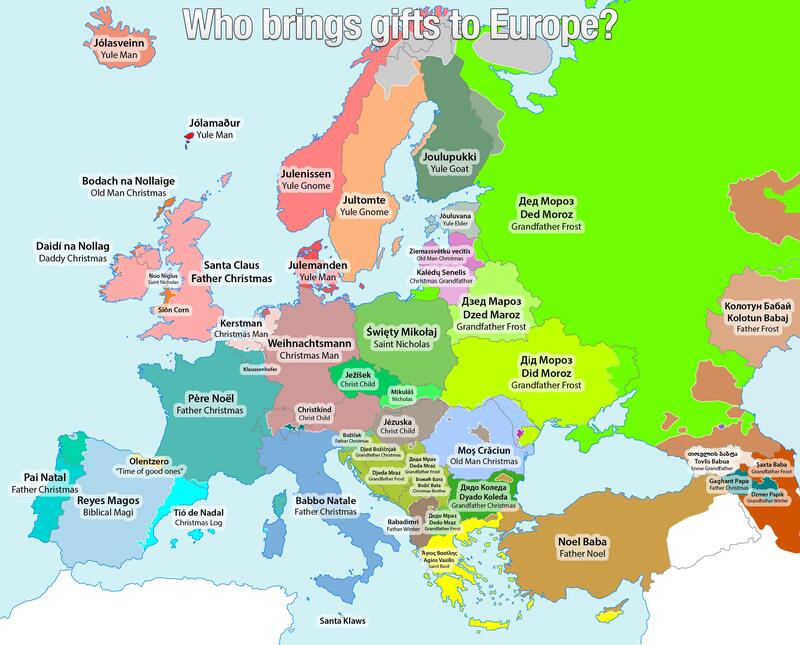 What Christmas traditions look like around the world is from The Washington Post. Here’s a little something for you – a holiday season activity is from ELT Stories. I really liked your blog comments on how you turned around the problems in your class in a positive manner, and was blown away by all your resources on the holidays. Great work. I liked the idea how you presented the topic . It is worth trying it in class especially expecting some prep activities before Christmas with my 6 grade students .Good job. I have also made a set of conversation prompt cards for adult language learners about Christmas and other related traditions. It comes with a SimplyQuest – internet exploring activities for the students to do as a post-task activity. Wow! This is a fantastic list. I can’t wait to explore. Thank you! Amazing. Simply amazing list. Thanks! Thank you so much for the amazing list of resources! 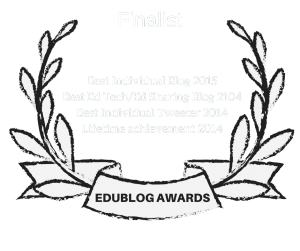 I have just written a post with a link to your blog and presented some of the resources you mention here.